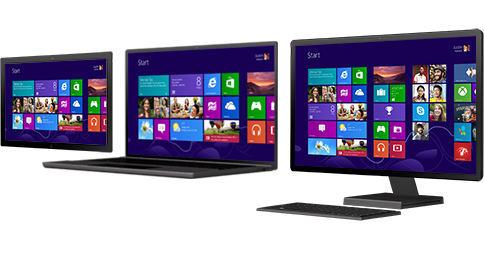 Microsoft has decided to cut Windows 8 license fees to OEMs, in an attempt to lower prices and boost lackluster demand for Windows 8 devices. The $20 discount will apply only to 11.6" and below touchscreen devices. For devices below 10.8", Microsoft will also offer free copies of Office 2013. 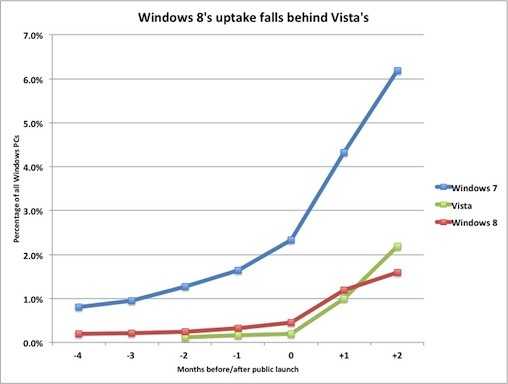 NetApplications data is skewed towards the US, so global Windows 8 adoption should be considerably worse. This is fairly consistent with the pre-launch metrics I had detailed and is the natural outcome of a flawed product strategy. A $20 discount in license cost is unlikely to reduce prices by a meaningful amount, so this is move is really just an incentive for OEMs to increase promotions. Microsoft's move to give away Office 2013 for free could theoretically generate some interest, but I still don't see a concrete value proposition to consumers to upgrade their PCs. Any consumer interested in this offer obviously is already an Office user and most likely a PC owner. A few early adopters may be swayed by this offer, but I don't expect it to have much of an impact. The most interesting part of this promotional campaign is that Microsoft seems to be restricting it to touchscreen devices. While Microsoft may be pushing the touchscreen paradigm as the future, touchscreen PCs are still targeted at the high-end market. Microsoft seems to be completely ignoring the low-end of the market, where tablets seem to be taking over. The existential threat to the PC industry & Microsoft has its roots at the bottom of the market, and it is impossible to defend that by focusing on the high-end of the market. Any rumored Windows 8/RT-based 7-inch devices won't truly be targeted at the bottom of the market as even the reduced license fee is inconsistent with the required cost structure. Microsoft seems to be fighting the wrong battle here and the consequences could be dire. Windows 8 is dead, face it MS! Without a proper desktop and a startmenu button Win8 will be just another experiment who'd failed.